Friendship Village is celebrating what they’ve named Heroes Month with a series of programs and activities dedicated to recognizing and celebrating the hero in everyone. This week there will be an assembly which will feature music, unique superhero t-shirts, as well as presentations by the Schaumburg Police Department and Fire Department who will talk about heroes. Each and every resident has a tremendous power and/or talent or strength within them. Unfortunately, older adults sometimes forget how important they are as they grow older. Sparkle, Shimmer and Dazzle Woman’s super power is helping to make the world a more beautiful place. Greek Goddess, Dancing Queen, Star Man, Bright Hope Lady... These are but a few of the names of a group of superheroes in the western suburbs, empowered to have a tremendous positive impact on those around them and charged with doing good. One additional characteristic that they have in common is the fact that they are all seniors, living at Friendship Village in Schaumburg. Friendship Village is celebrating what they’ve named Heroes Month with a series of programs and activities dedicated to recognizing and celebrating the hero in everyone. “Each and every resident has a tremendous power and/or talent or strength within them. Unfortunately, older adults sometimes forget how important they are as they grow older. Some may start to feel like more of a burden, than a superhero. Heroes Month celebrates how amazing our residents are,” said Donna Brown, lifestyles activities manager for Friendship Village. 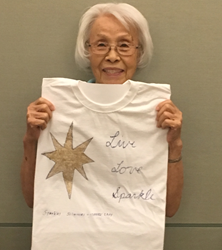 After deciding on a superhero name, residents decorated their own unique superhero t-shirt. They will all do them this week for an assembly which will feature music, as well as presentations by the Schaumburg Police Department and Fire Department who will talk about heroes. A veteran will also address the group. Chaplain Shawn Kafader of Friendship Village is hosting Bible Baseball-Heroes of Faith, a Bible hero trivia game, scored like baseball.